For this Molasses Mulit-seed Bread I turned (again!) to the recipes on the King Arthur Flour website. Their recipes are always and when I am trying something new I feel confident in sampling a different technique or combination of flavors under their guidance. 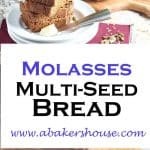 This month both the strong flavor of molasses and the heavy dose of seeds were new to me and the recipe for Molasses Multi-seed Bread was spot-on. You can use any type of seeds that you’d like; here I used pumpkin seeds instead of the sunflower seeds in the recipe along with poppy seeds, sesame seeds and flax seeds. 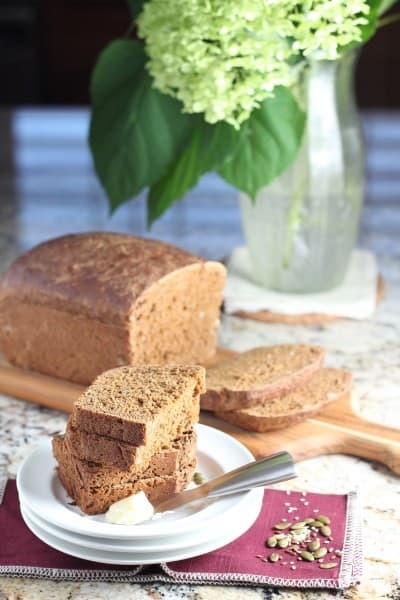 This Molasses Multi-seed Bread is a rich, flavorful bread. It is hearty enough to stand up to sandwich-making yet simple enough to enjoy with a pat of softened butter. The recipe was explained so well on the King Arthur Flour site that I will simply list their ingredients here and provide the link to the full recipe. Happy Baking! Please find the original recipe and instructions here from King Arthur Flour. 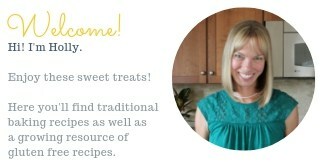 I am so pleased to be able to bake with the #TwelveLoaves group of bakers this month. #TwelveLoaves is a monthly bread baking party created by Lora from Cake Duchess; it runs smoothly online with the help of Heather of girlichef and the rest of our fabulous bakers. Our host this September is Lora from Cake Duchess and our theme is Seeds.For more bread recipes, visit the #TwelveLoaves Pinterest board, or check out last month’s selection of #TwelveLoaves Malt Breads! 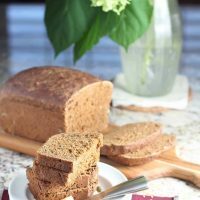 For more bread recipes, visit the #TwelveLoaves Pinterest board, or check out last month’s selection of #TwelveLoaves Seed Breads! Thanks, Liz, yes, this would be a good loaf to make double and freeze for later. Nice baking with you this month! what a great loaf, love the seed combination and molasses make everything taste so wonderful! Thanks so much! I thought the seed theme was a good one. Beautiful breads this month! That sounds delicious and looks beautiful Holly! When in doubt, I turn to KAF too! Yes, KAF has a standard of reliability and experience. I’ve never gone wrong with their recipes. Beautiful loaf! Yes, I always feel like I can depend on KA’s recipes too. I love using molasses! And I never knew that about ascorbic acid! This is superb, Holly! Sounds amazing! I had tried this in my own restaurant and served with sandwiches. One can use different seeds such as poppy seeds, sesame seeds, pumpkin sees etc.